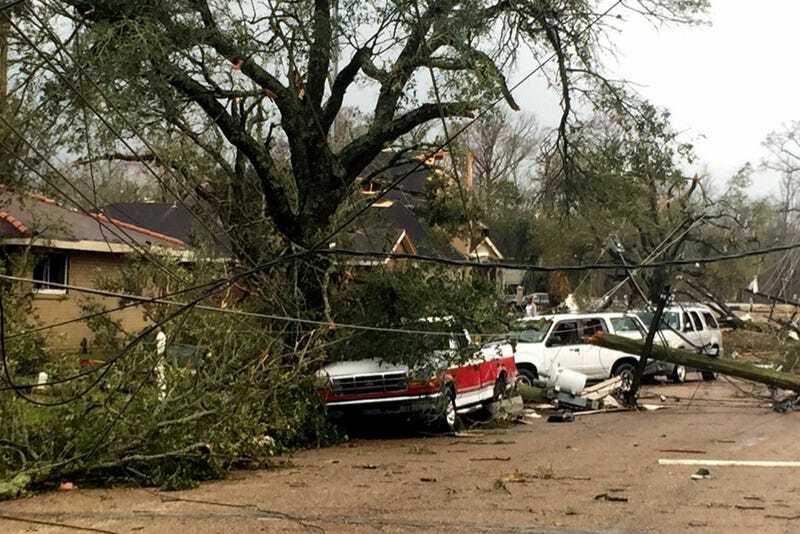 Multiple tornadoes touched down in southern Louisiana Tuesday, downing power lines and ripping houses from their foundations as they passed through. CBS News reports that a spokesman for Gov. John Bel Edwards declared a state of emergency Tuesday afternoon. Danielle Manning, a meteorologist with the National Weather Service, said that tornadoes touched down in at least three areas—one in the eastern part of New Orleans, which had already been hard hit by Hurricane Katrina in 2005; one near the town of Donaldsonville; and another in the town of Killian. The tornado in New Orleans East touched down at 11:33 a.m. and was part of a large weather system that was sweeping through Louisiana, Mississippi and Alabama, with over 2.5 million people in the storm’s path, according to CBS News. New Orleans Mayor Mitch Landrieu said that there were two serious injuries and dozens of minor injuries initially reported, while a spokesman for the Emergency Medical Service said that most of those injured had minor scrapes and cuts. About 10,000 homes were without power, and there were reports of gas leaks in the area, according to city officials. Police Chief Michael Harrison urged people to stay off the roads and said that patrols were doing house-by-house searches in affected neighborhoods to make sure no one was trapped by falling debris or other damage. New Orleans East resident Sheryl McBride told the New Orleans Advocate that she rushed into her bathtub when the tornado struck her home. “As soon as I got in, stooped down, the roof came off, things started flying. I asked Jesus to cover me, don’t let me get hurt. Next thing you know, here we are,” McBride said while standing in the wreckage of her home.